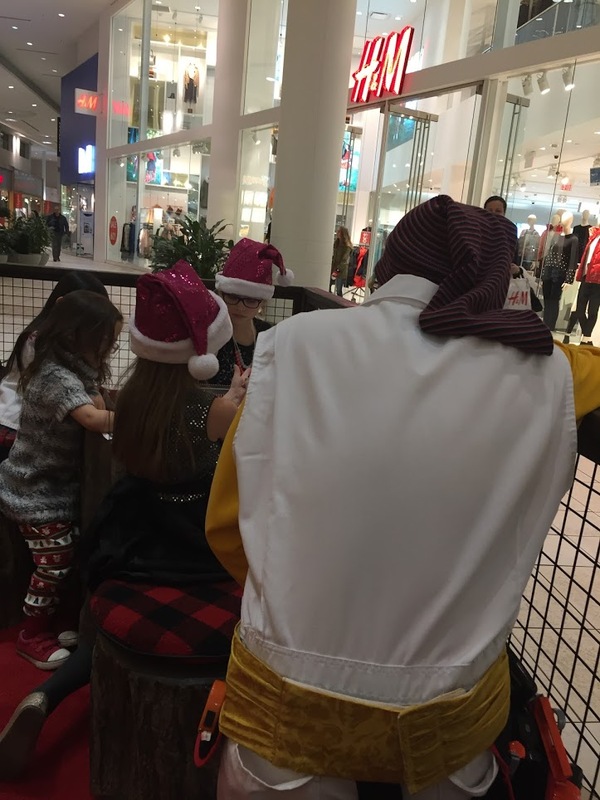 Last Monday, we headed to Chinook Centre to finish up our Christmas shopping and more importantly, go visit Santa. Visiting Chinook at Christmas time is one of my favourite holiday activities. 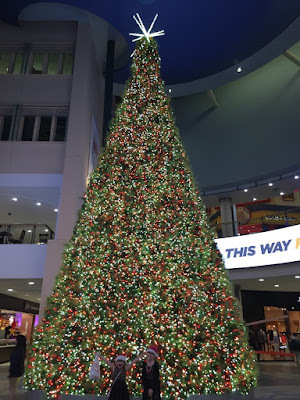 Every year there is something familiar and something fresh and new. 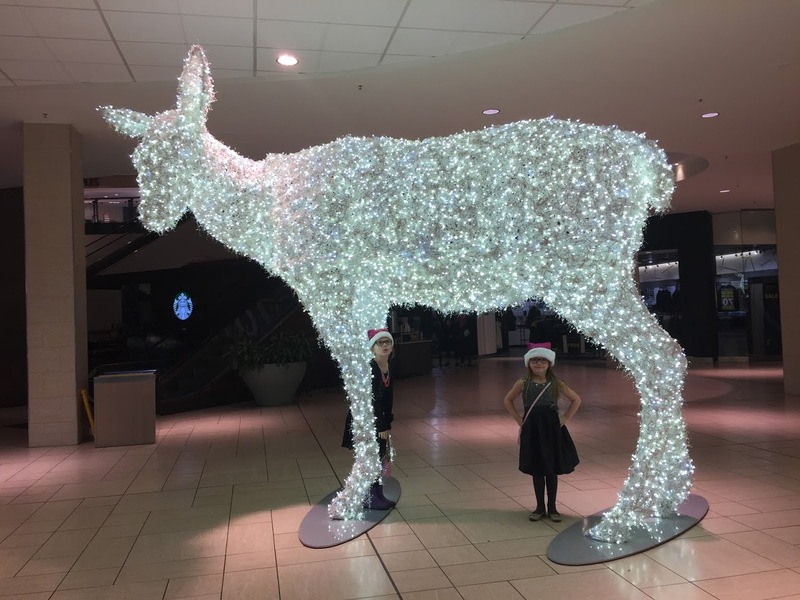 We parked near the Old Navy entrance in the parkade and when we entered you could see the flying reindeer as soon we walked up the ramp and the girls were pumped and full of excitement. It was gonna be a long few hours before it was our time to meet Santa. Thankfully he was on his supper break and the girls couldn't sneak a peak and make it worse haha. Finley was disappointed that they took away their Santa telescope this year but I think this tree more then made up for it. The lights change and flash and is so tall and just completely amazing. We saw a bunch of amazing trees when we were at Disneyland last holiday season but this is pretty close to how spectacular those were. 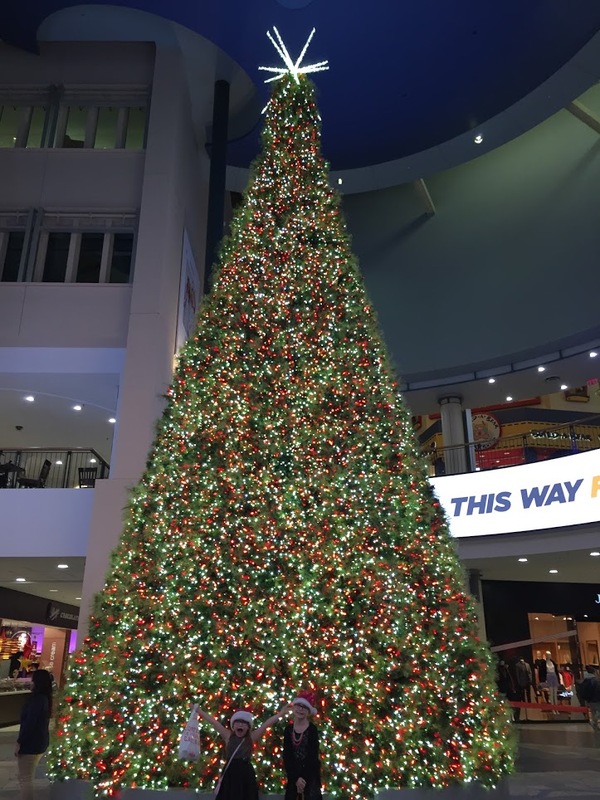 You can go up to the second level by the food court and see the top of the tree up close. It was pretty fantastic. 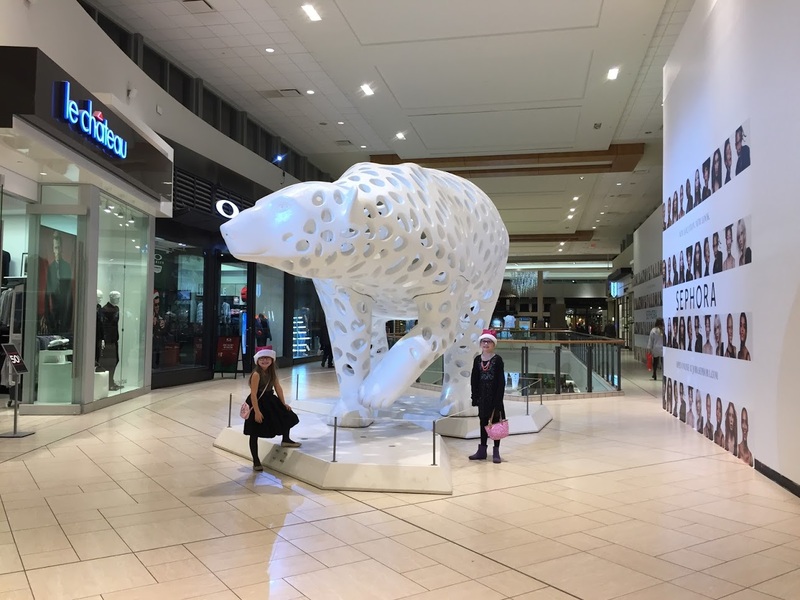 These ceramic like animals have become a holiday tradition at Chinook. I don't know if they are always in the same spot but I am pretty sure they are. These have always been a favourite of the girls. When we turned the corner and saw this, it reminded me of the light parade in Disneyworld back in 2008 and Cinderella's pumpkin float. Cinderella is my favourite and so I very much loved this. The girls did not make this connection at all. They both loved this one though and it was definitely a photo opp favourite amongst the shoppers. I was very happy that we chose to visit Chinook Centre on a Monday night because it was super dead and we didn't have many people photobombing our photos. This one is another new favourite and it is outside the old Target location on the lower level. Seriously the light up animals are just ridiculously awesome. Finally it was time to go see Santa Claus! We had booked an appointment online several weeks in advance to see him on a Monday night because Monday's are always are soccer free night and it worked well for our schedule. Chinook still accepts walk up visits and when I asked about the ratio, one of the helpers told me that the majority of their visits are walk ups and that they only book 6 appointments per hour ahead of time. She also told me that they see the same name numerous times over different dates and times because some didn't know when they could make it so took advantage of the system to take up multiple spots. Even though this had been done, they still have to treat it like every reservation is coming and have to close the lines to people who do show up and wait. I hate people like that. They have a great waiting area once you check in. They have colouring and lego for kids and "elves" to keep the kids happy while waiting. 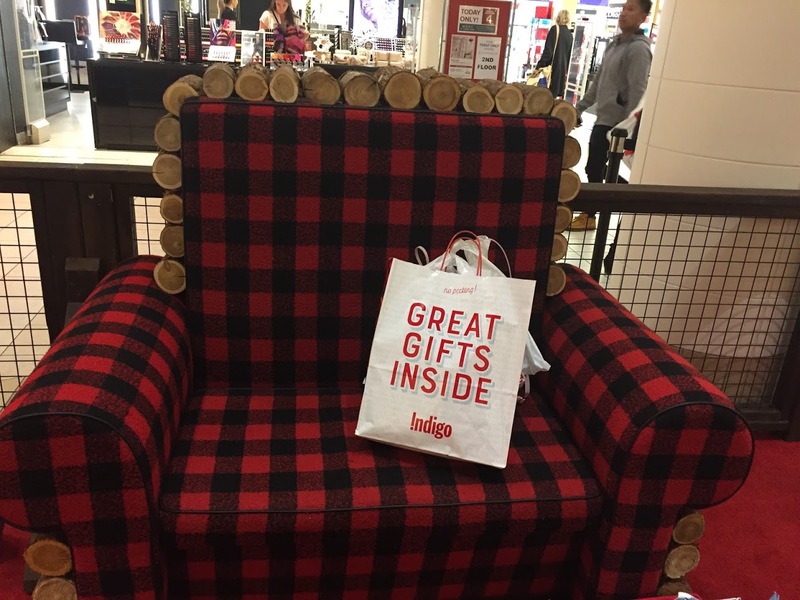 They also have an amazing seating area for parents and adults waiting to get their photos taken with Santa Claus. 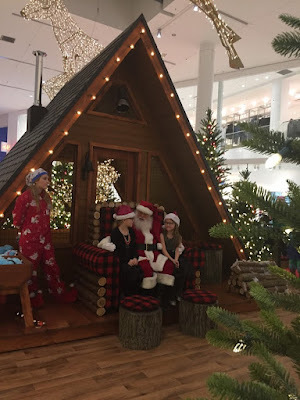 Interestingly enough when we were there more adults waiting to see Santa then children haha. We got into see Santa 4 minutes earlier then our appointment and there was no line up otherwise so Monday's might be the night to go if you don't want line ups. They took a few photos of the girls and this is the one that I chose. I wish it went the other way though because then it would have fit in my Christmas frame my aunt got me years ago. I love the chair fabric and the rustic decor very much. 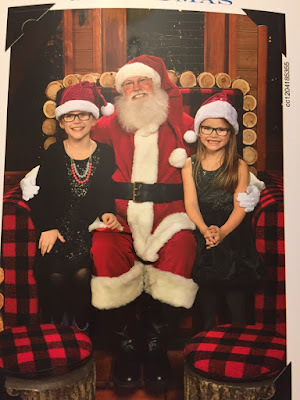 After they took the Santa photos, the girls had a good chat with Santa about their christmas lists: Finley wants the ski lift lego friends set, a dream catcher and either emoji lego and a really cool science kit. Santa said the first 2 were easy but man those last 2 are tough haha. Emoji lego doesn't exist and "he" can't find a science kit that isn't junk.....send all ideas to Santa haha. Penelope asked Santa for a size 5 pink nike soccer ball (she was precise haha), The Belle lego castle, and a poop emoji unicorn pillow. Hers was much easier then her sisters haha. And instead of candy canes after their visit from Santa, they got these stuffy frozen things. 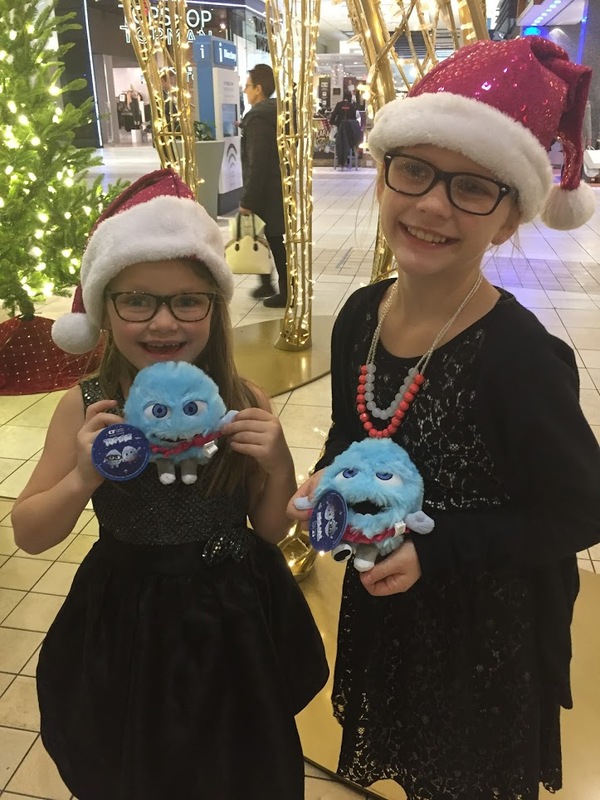 One is named Shiver and I don't remember the other ones name but the girls LOVED these so much. I was hoping for a candy cane so I could steal a bite of it or 2. All in all, it was a successful night at Chinook Centre visiting with Santa and getting to see all of the Christmas displays without crazy crowds of people. 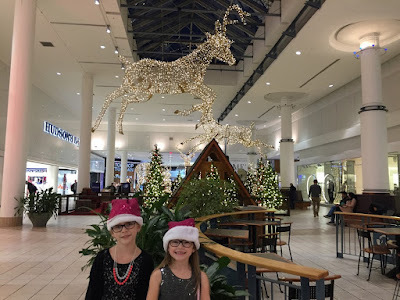 We also finished all of our christmas shopping...or at least I thought I did at the time hahaha. 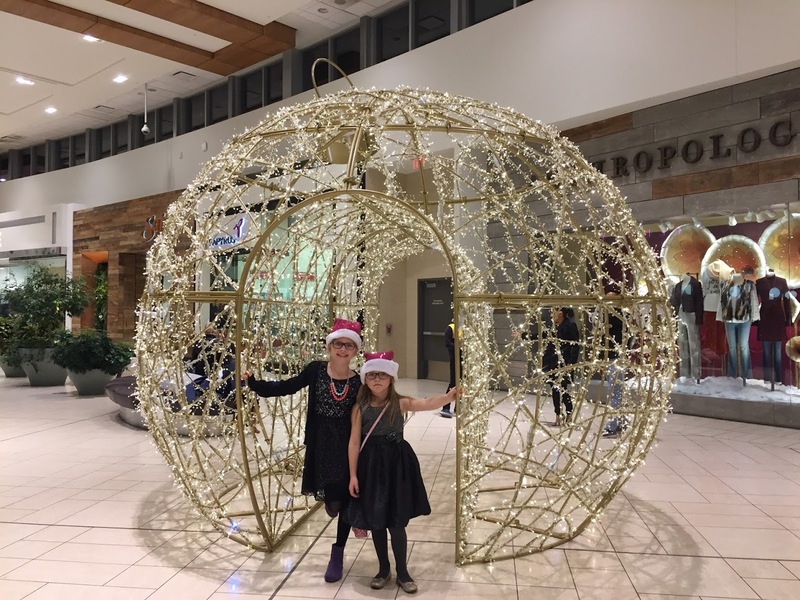 If you are around for the holidays, make sure you add check out the Chinook Centre displays to your list!